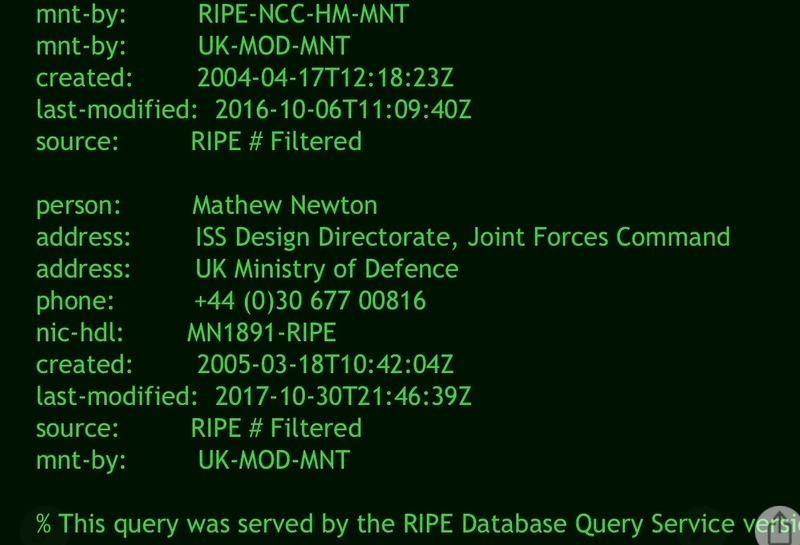 UK MInistry of Defense IP address? Why? I recently did an analysis of my cellphone using a couple of different iPhone utility apps—Net Analyzer Pro and Wolfram’s Net Admin. 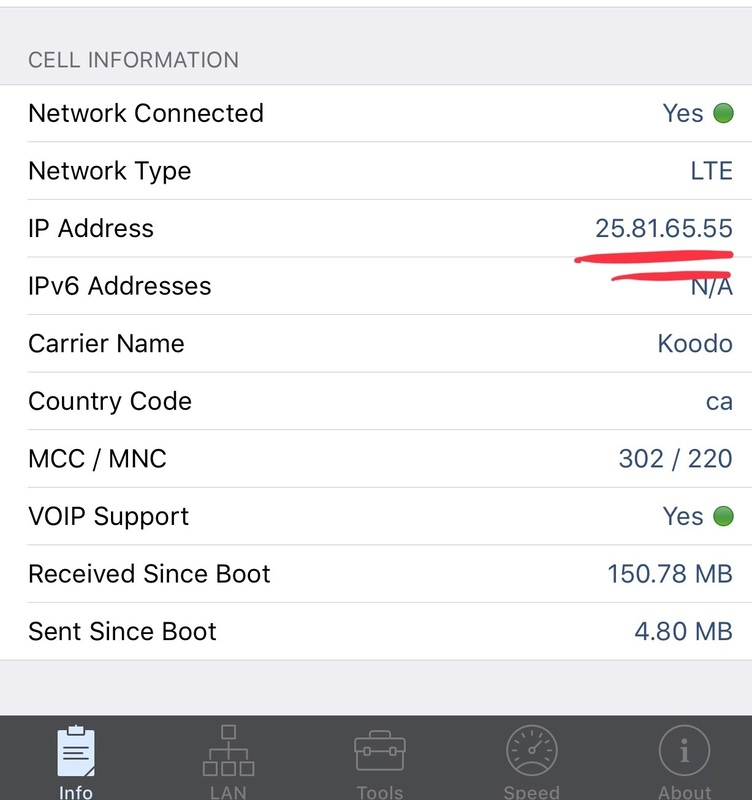 Both of these apps listed my Canadian cell phone provider (Koodo) as having an IP address registered with the UK Ministry of Defense. I’m no expert on the subject, but this does strike me as rather odd. I’m wondering if anyone else is familiar with this oddity and can provide an answer? My phone is a couple of generations newer than my daughter’s, and I often find it freezing or running slower than hers when we are both accessing the same web sites. That is what caused me to check my settings using the above mentioned utilities and subsequently to discover this weird issue. What app are you using? It is strange to me and they weren't native app of iphone and ios. I wonder those apps are the problem. Are you using any VPN or internet profile in your phone? Can you go to the website https://checkmyip.com/ and took a snapshot of it? Can you take and post a screenshot? You could try to turn off WiFi and use Safari web browser to check your IP Adress. Just go to https://Checkmyip.com That page will tell you your phone IP address and location of it. I’ve done as requested and herewith provide the screenshots. Dinh, I’ve done as you suggested and the errant IP under Cell Information persists. 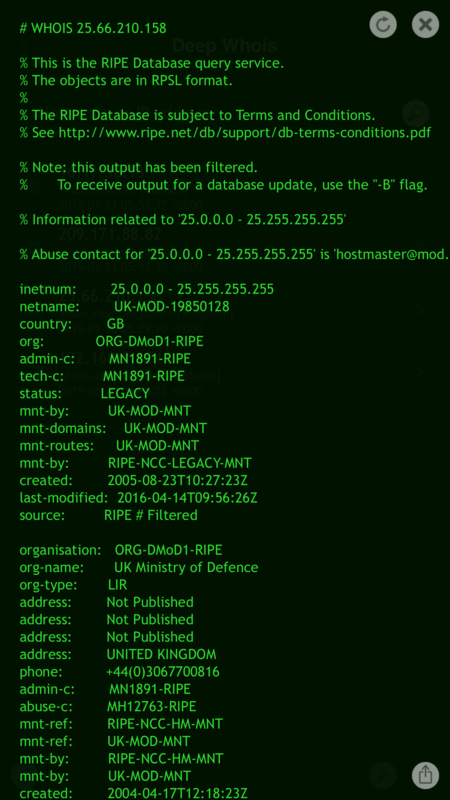 I also contacted the UK Ministry of Defense and they responded by confirming that the “25.66.210.158” address is in use by them, but has no Internet connectivity. The host master suggested that it’s either in local use by Koodo/Telus or it has become a spoofed address. I would login to your gmail on your phone (via data) and then check if the IP address of your gmail login history to see if it matches.